When it's zendala challenge time, I create a page with two small zendala's (90 x 90 mm) and a large one about 160mm square, to fit underneath the two small ones. This way I can use either one to work on, and still have a spare to do at a later date. I print them out onto a lightweight card which I find takes the micron pen quite well. Today I decided to do a small one so I could complete it tonight, so here we are!! Tangles: Dijon, Drupe, Crescent Moon, Flux, Hypnotic. Very pretty. Thanks for including a list of the tangles you used. No problem. I will try to keep it up!! Very nice! I like how all of these are turning out. I think we got a very special template this time. I also like the birds on you blog here. yes the birds are cute, thats why I chose them they make me smile! 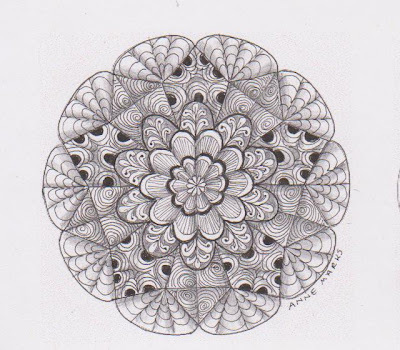 Great zendala, you have created a nice piece or art. Really nice, what have you used, is it a silver pen? I used only black micron pen, and left gaps. Very beautiful, with a lacy result. Very Pretty, love your choice of tangles ! 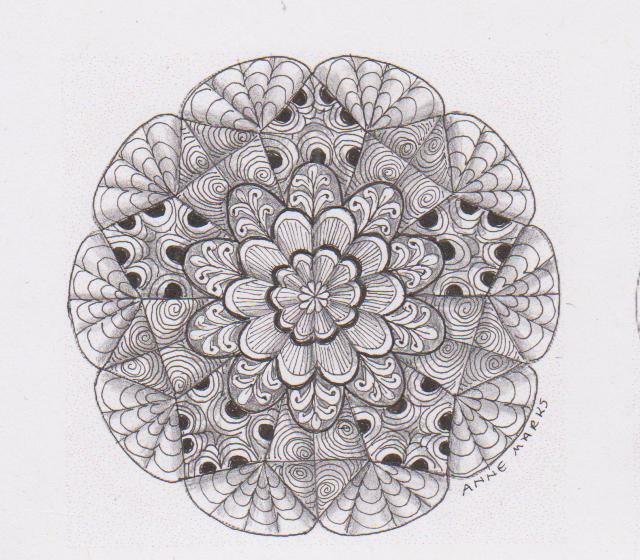 This template is bringing out some really beautiful zendalas, every time I open I blog I am more impressed! I feel like I am looking at an old world work of art! So gorgeous! This is lovely. It is very lacy and delicate looking. I love it! I like the list of each tangle you used. I will start to do that also. Its a great help! Nice work. I like how your tangles and shading makes the Pentagon stand out. Thank you for naming the tangles - it really helps newby's and those of us with not very good memories! This is very pretty! I 'specially like the way you've done hypnotic - so good to see it in something not quite square, and you've shaded so well! Thanks for that Sue. Im going to try to keep up with the names!! Sometimes I forget where they came from so cant find the name, esp if not in Lindaa's book.